Small manual handling aids can make a big difference to both client and carer in achieving transfers from one piece of furniture to another – from bed to chair, perhaps – or from one position to another. They can often be a useful supplement to the hoists and transfer aids described elsewhere in this section, which are fairly large pieces of equipment that require both space and investment. This sheet (left) combines a majority easy-slide surface with a non-slip lower section, where the heels can get purchase to enable the person to turn themselves over independently. Positioning aids that move in one direction only, such as this product on the right, are useful for maintaining a good position for people who tend to slide forwards in a bed or chair. This can be helpful in ensuring correct posture. The aid remains in position so that it can be re-used as often as necessary without disturbance for the patient. A turntable, or transfer disc, (left) allows for smooth, controllable turning, without the carer having to twist, and without the jerky movements associated with shuffling the feet around manually, which could be uncomfortable or dangerous for the patient. The risk of loss of balance and injury to both patient and carer are much reduced. A non-slip surface adds to security. The handling belt (right) can be used in conjunction with turntables and other aids such as boards and sheets. It provides a more comfortable, secure and dignified means of gripping the patient. Lifting the legs into or out of bed, or moving their position in a chair, can be tiring and difficult for the disabled person, hazardous for the carer, accounting as they do for roughly a third of the body’s weight. Leg lifters may be an answer, either powered or manual. Recent research suggests that manual leg lifters may be more useful for individuals with impairments that only affect their legs, while those with more generalised disabilities hindering their ability to balance while sitting, benefit more from powered leg lifters. There are various different designs available, according to individual needs and abilities. Many people need some help to move from lying to sitting – a couple of different systems can be of use here. A monkey pole (left) offers a horizontal bar to assist with independent movement between sitting and standing positions, and a trapeze handle to enable the user to pull themselves up from lying to sitting. 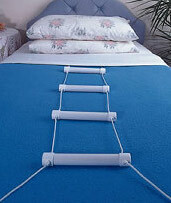 A bed ladder (right) is another, very low tech manual handling aid: a variation on a rope ladder lies on the surface of the bed, enabling the user to pull themselves up to a sitting position, hand over hand. 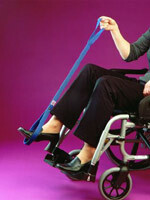 For less independently mobile individuals, slide sheets can facilitate movement without the need to lift. These sheets are made from ultra low friction material, allowing a carer to turn a patient over, change their position in bed, or move them off the bed onto a trolley or therapy couch, without causing pain and shearing to delicate skin. Use this form to send an email about Small Manual Handling Aids to Independent Living. Your contact details will be held securely, so that we can reply to you and deal with your query.